QUESTION: What is the best carrier oil for essential oils? We often hear this question from our clients who are looking for the best carrier oil to dilute their essential oils. Below you’ll find three factors to consider when making your choice. We also provide you with a list of descriptions of some of the most popular carrier oils for easy reference. 1. If the carrier is being used to promote transdermal (skin) absorption of the essential oils and there are NO skin issues to take into consideration, you can you can use any carrier oil that you have available. (Or as an alternative you can also use your regular body lotion or cream.) Transdermal is a route of administration wherein active ingredients are delivered across the skin for systemic distribution, please review application methods we list for each essential oil and blend for safety precautions. 2. Make sure your carrier does not contain mineral oil in the ingredients. Mineral oil molecules are larger than our skin pores; the molecules will sit on the top of the skin and prevent transdermal absorption of your essential oils. Mineral oil is also a by-product of petroleum distillation, it may contain toxins, it can clog pores and it does not contain any skin nourishing nutrients. 3. The best carrier oil for essential oils often will depend on your skin type, health, age, and biochemistry. Some common carriers we recommend include Coconut or Fractionated Coconut, Sweet Almond Oil and Jojoba, Olive, Sesame or Grapeseed Oil. However, we want to include more specific recommendations for people who have sensitive skin due to age or health concerns. Children: Calendula, Jojoba, Fractionated Coconut, or Sesame oil. Thin or easily irritated skin: If you have thinner skin (common with the elderly population) or skin that is easily irritated, consider using a blend of carrier oils i.e. 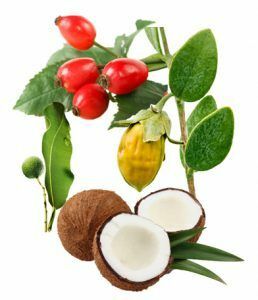 Rosehip, Calendula, or Tamanu in a base of Jojoba or Fractionated Coconut. As with essential oils, carrier oils have unique chemical constituents and properties. Often the most effective carrier will be a blend, as it can provide a broader spectrum of skin soothing and nourishing benefits. Shelf life mentioned below are general guidelines. Oils will last longer or shorter time frame depending on conditions which they are stored i.e. temperature and volume per container (extra air space in a container increases oxidation rate). Sweet Almond Oil Prunis dulcis – This is a good choice for all skin types to soothe, soften, and protect and is helpful for dryness, itching, eczema, and dermatitis. Shelf Life: Best used within 1 year. Calendula Calendula officinalis – Calendula oil is gentle and soothing for dry, inflamed or irritated skin, use for small wounds, acne, bed sores, varicose veins, rashes, diaper rash, eczema, psoriasis or for all over skin care. Fractionated Coconut Cocos nucifera – Fractionated Coconut Oil is odorless, clear, lightweight, non-greasy, easily absorbed, and highly stable (resists rancidity). It makes a good base when combining carrier oils or when diluting if you are mixing in bulk and product will not be used quickly. Jojoba Simmondsia chinensis – This carrier has anti-inflammatory properties; it is especially compatible with skin because it closely resembles skin’s natural oil, sebum, and does not clog pores. Rosehip Rosa mosqueta – This carrier is used to soften fine lines and wrinkles, help repair sun-damaged skin, reduce scarring, improve elasticity, and protect the skin from environmental damage. Shelf Life: Best used within 6 months. Tamanu Calophyllum inophyllum – A good choice for insect bites, minor burns, small cuts, blisters, and scrapes; it is helpful for nerve pain conditions such as neuralgia, shingles, and sciatica. There are even more carrier oil options available. If you have a question on another carrier oil, we’re happy to help you discover the best carrier for the essential oils you’re using. 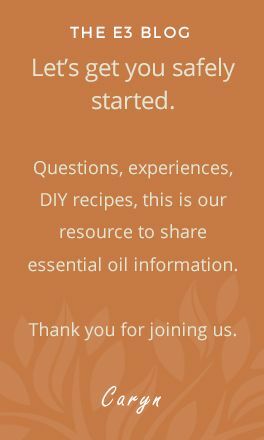 If you would like to learn more about essential oils – like where they come from, how they’re made and how to make your own special blends – please feel free to download our free ebook, Listen to Your Nose – An Introduction to Aromatherapy. 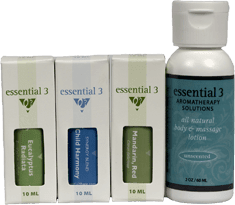 New to essential oils or to E3? Our INTRODUCTORY OFFER is an easy and affordable way to get started. Experience our wonderful essential oil singles and synergy blends. Sign up for our Newsletter and receive a 20% discount coupon. Don't worry, we never spam.